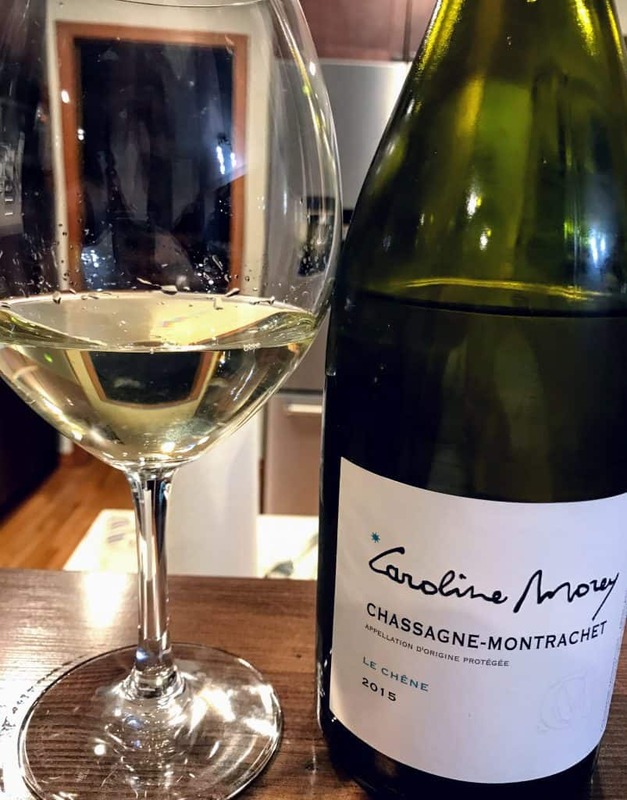 As with our first edition featuring the Boillot family, we’re going to explore the many Morey estates in Meursault and Chassagne-Montrachet, trying to dissect the tangled weave of similar names to see how the estates may (or may not) be related. The Morey family’s history in Burgundy dates back to at least the 16th century with evidence of winemaking in Meursault since 1793. The history in Chassagne-Montrachet dates back to Claude Morey’s arrival from the village of Paris l’Hôpital in 1643. In 1950, Albert Morey (father of Jean-Marc and Bernard) was one of the first estates in Chassagne-Montrachet to domaine bottle. In studying the various Morey domaines, the family’s prominence in the Grand Cru vineyard of Bâtard-Montrachet is apparent with several members producing examples. Most of the Morey Bâtards come from tiny holdings averaging only around 0.11 hectare (≈ 0.27 acres). Domaine Pierre Morey owns the largest amount with nearly half a hectare. Meanwhile, Domaine Pierre-Yves Colin-Morey contracts with multiple growers in the Grand Cru to expand his production. Founded in 1971 by Pierre Morey, son of Auguste Morey, who farmed several parcels for Domaine Comte Lafon under métayage agreement. For two decades, Pierre also served as vineyard and winery manager for Domaine Leflaive. During this time he was inspired to convert his estate to organic viticulture in 1992 and biodynamic in 1997. Tiny 4.5 ha domaine ran by Rémy Ehret, son-in-law of the original owners, and Valentin Jobard. The vineyards are farmed using sustainable viticulture. Unfortunately not much information is available about this estate to decipher the connection to the other Moreys or to estates like Domaine Antoine Jobard. Founded in 1981 by Jean-Marc after the retirement of his father, Albert Morey, with his father’s holdings divided between Jean-Marc and his brother Bernard (Thomas & Vincent’s father). For almost two decades his daughter, Caroline, has helped him manage the property with his son, Sylvain, running Bastide du Claux in the Luberon. Founded in 1919 by Marc’s father Fernand Morey with Marc taking over the family estate in 1944. In 1978, the estate was divided between his two children. His son, Michael, took his share to establish Domaine Morey-Coffinet. 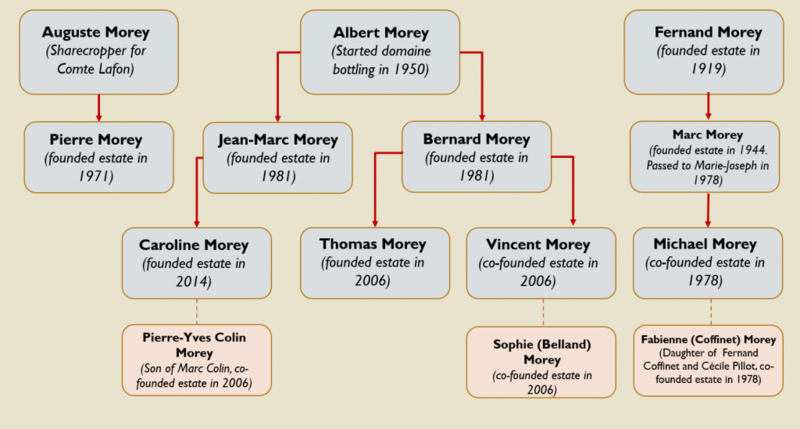 His daughter, Marie-Joseph, and her husband Bernard Mollard used their holdings to continue Domaine Marc Morey. Today, their daughter Sabine runs the estate. All the vineyards are farmed sustainably. Founded in 2001 as a négociant firm by Pierre-Yves Colin (son of Marc Colin in St. Aubin) and Caroline Morey, daughter of Jean-Marc Morey. The first solo vintage of estate fruit was in 2006. Prior to returning to his father’s estate in 1995, Pierre-Yves spent time working in California at estates like Chalk Hill. Additionally he worked harvests in the Loire and Rhone. Domaine Pierre-Yves Colin-Morey farm their vineyards sustainably with some hectares farmed completely organic. Founded in 2014 by Caroline Morey, daughter of Jean-Marc Morey and wife of Pierre-Yves Colin. The domaine owns 7 ha inherited from Caroline’s father in Chassagne-Montrachet and Santenay. Founded in 2006 when the estate of Bernard Morey (Jean-Marc’s brother) was divided between his sons, Thomas and Vincent. The estate focus on red Pinot noir is unique among the Moreys. All the vineyards are farmed sustainably. Founded in 2006 when Vincent inherited his share of his father’s estate. His wife Sophie is from the notable Belland family in Santenay . Their marriage brought around 12 ha to the domaine. All vineyards are sustainably farmed. Founded in 1978 when Michael Morey, son of Marc, combined his inheritance with that of his wife, Fabienne (daughter of Fernand Coffinet and Cécile Pillot). The other part of Domaine Coffinet went to Fabienne’s sister, Laure, who founded Domaine Coffinet-Duvernay. The estate has been practicing organic cultivation (receiving Ecocert in 2015) and is converting over to biodynamic. Tagged Albert Morey, and Wines, Appellations, Bastide du Claux, Bâtard-Montrachet, Beaune wine, Belland family, Bernard Morey, Bienvenues-Bâtard-Montrachet, Bill Nanson, biodynamic, Boillot family, Burgundy: A Comprehensive Guide to the Producers, Caroline Morey, Cécile Pillot, Chalk Hill, Chardonnay, Charles Taylor, Charmes, Chassagne-Montrachet, Chevalier-Montrachet, Claude Morey, Clive Coates, Corton-Charlemagne, Dent de Chien, Domaine Antoine Jobard, domaine bottling, Domaine Coffinet-Duvernay, Domaine Comte Lafon, Domaine Emile Jobard-Morey, Domaine Leflaive, Ecocert, En Remilly, En Virondot, Fernand Coffinet, Fernand Morey, Grèves, Jean-Marc Morey, Keeping up with the Joneses in Burgundy, Le Montrachet, Le Porusot, Les Blanchots-Dessus, Les Caillerets, Les Champs Gains, Les Charmois, Les Chenevottes, Les Embrazées, Les Grand Epenots, Les Perrières, Luberon wine, Making Sense of Burgundy, Marc Colin, Marc Morey, Matt Kramer, métayage, Meursault, Michael Morey, Morey family, Organic viticulture, Pierre Morey, Pierre-Yves Colin-Morey, Pinot noir, Pommard, quasi-monopole, Remington Norman, Rémy Ehret, Robert Parker, Sabine Mollard, Santenay, Sophie Morey, St. Aubin, Sustainable Viticulture, The Finest Wines of Burgundy, The Great Domaines of Burgundy, The Wines of Burgundy, Thomas Morey, Valentin Jobard, Vide-Bourse, Vincent Morey.